Please join us in welcoming these new additions to our NMC staff, and congratulating current NMC staff on their new positions! TRAVERSE CITY — Northwestern Michigan College’s newest publication, Nexus, has been named the top community college magazine by the National Council for Marketing & Public Relations. Produced by NMC’s Public Relations, Marketing & Communications department, Nexus received the 2017 gold Paragon award from NCMPR at its annual conference in Las Vegas in March. The magazine was commended for its strong NMC success stories shared with a broad audience in a compelling visual presentation. In its print magazine category, NMC bested Randolph Community College in Asheboro, N.C. (silver) and Red Deer College in Alberta, Canada (bronze). Nexus took the top award in its debut year. In 2017 the college introduced the 32-page magazine to update and replace an eight-page newsletter. It is created in partnership with Traverse City-based MyNorth Media. NMC provides editorial content while MyNorth designs and prints the publication. It mails to about 27,000 college alumni, donors, volunteers and other constituents in January and June. Awards were made in 53 different categories. NMC’s print, video and special event work has previously been honored by NCMPR at both regional and national levels. NCMPR is the exclusive professional development organization for marketing and public relations staff at community and technical colleges. An affiliate of the American Association of Community Colleges, NCMPR has more than 1,550 members at more than 650 colleges in the U.S., Canada and other countries. NMC’s biannual Long Night Against Procrastination (LNAP) is returning to the Osterlin Library! 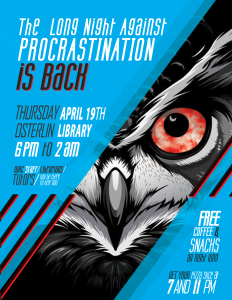 On Thursday, April 19, 6 p.m. – 2 a.m. the Writing & Reading Center, Tutoring, Advising, Student Success, and NMC librarians will be staying up very, very LATE to help students crush their final papers and exams. Free pizza at 7 p.m. and 11 p.m., a finals-themed “meme cake,” free snacks (including Grand Traverse Pie Company pie) and coffee until 2 a.m. and lots of raffle prizes!